Do you ever wonder how to make homemade filo (phyllo) for Balkan mixed burek (meat and potato) pie? Wonder no longer as we’re delving into jufka (a fancy name for the homemade filo dough), stretched into thinnest of sheets intended for making stuffed pastries (such as this meat and potato pie called mixed burek). First of all, don’t run away! Secondly, if this is your first time making phyllo for pies, read my earlier how to make jufka article. It has good instructions and a bunch of helpful tips. You don’t have to, of course. But reading both will make it easier to make homemade filo and today’s burek, or mixed pie with meat and potatoes. But what if you came here for the short – albeit homemade – filo instructions? What do you need to make homemade filo? an unopened bag of flour. 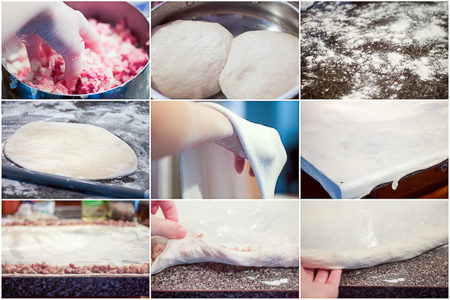 Thirdly – jufka, kore, filo and phyllo- all mean the same thing: dough stretched out until it’s thin. Think baking paper thin. (Or between baking paper and cigarette paper thin.) Or when you blow a bubble gum balloon thin. 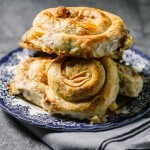 Scrumptious, flaky and stuffed Balkan pies (balkanske pite) are the definition of comfort food. As comforting as a good rack of BBQ ribs for some, or a thick tomato soup plus a grilled cheese for others. There are many different types of pies. This one is called šareni burek, which translates to “colorful meat pie.” To simplify the name I named it mixed burek. That problematic mixed burek pie! 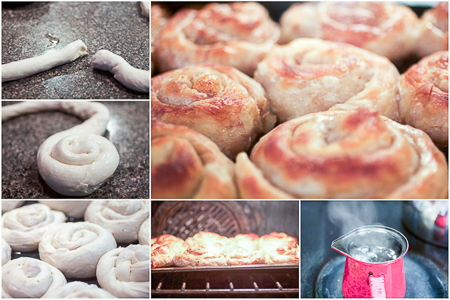 If you’ve read the article mentioned above, you’re now aware of the Balkan “burek” wars. Burek is a contentious word across the region. 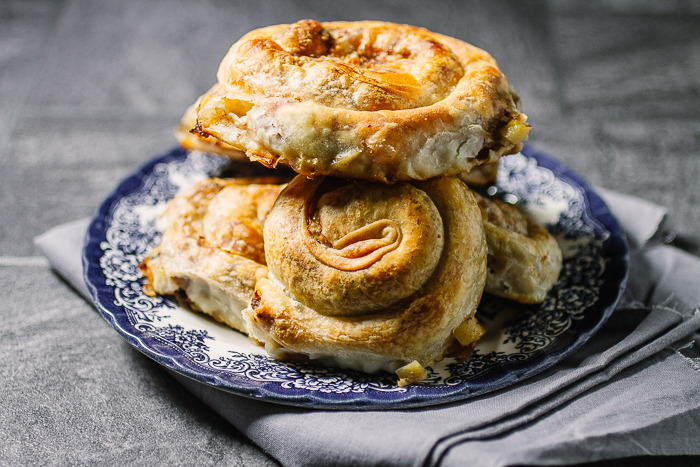 “Burek” comes from the Turkish word “börek.” (After all, burek is an Ottoman dish.) 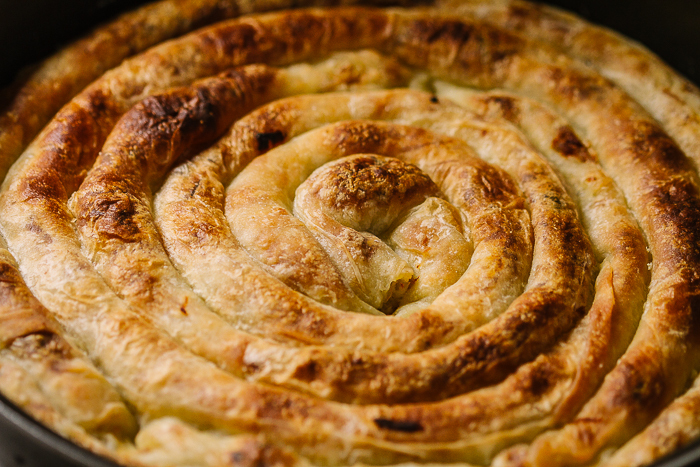 “Börek” is the catchall name for most pies. All baked filo pastries with a filling are considered “börek” in Turkey. And the rest of Balkans. In BiH, the only pie considered to be burek is the meat filled pie. Burek equals meat pie. Always. Even if it’s etymologically faulty, being from Sarajevo I’m on the side of burek being the meat pie only. But I don’t care what you call it. I just want you to make it! 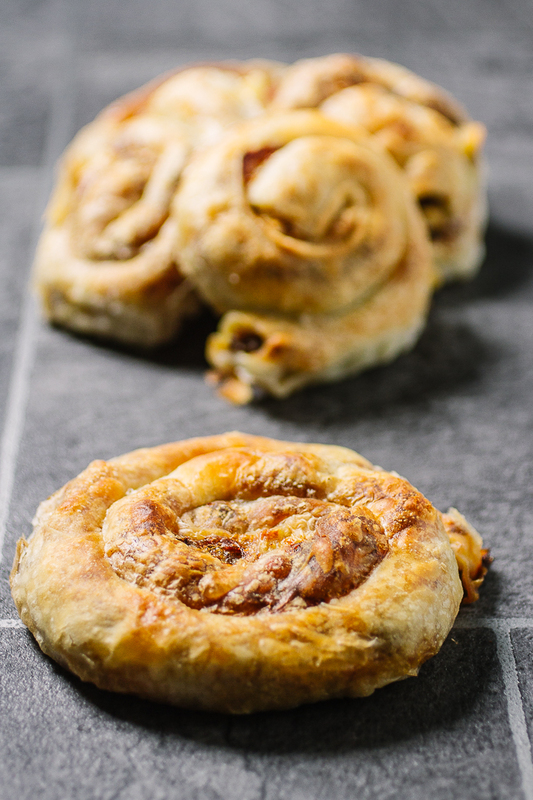 Even if it is derived from the Ottomans, our beloved burek has long ago taken on the simplicity and straight forwardness that is the Balkan cuisine. Burek has become as Balkan as the Balkans itself. Even Turks that visit the Balkans agree pies here have far surpassed all other filo pies. People from the former Yugoslavia know they’ve arrived home when upon opening the door they’re hit with the aroma of pie just taken out of the oven. The moment of recognition, starting from the first time this occurs, contains in itself an entire childhood. One immediately retreats into the safety of memories, bringing back Saturdays. Bringing back memories of mom making homemade filo pies. The kitchen takes on a large symbolism in the familiarity of those lulled memories. There, shiny balls of dough sit on the kitchen towels waiting to be spread out. 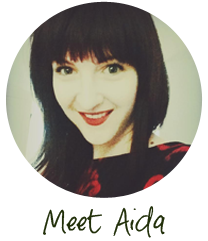 When we moved to the US – a place where no one understood why we came, a place where also no one knew where Bosnia was; it sounded like a weird Boston in Africa), the food mom made was a type of a green card for us. Proof we indeed were good people, did things the right way, and had a history somewhere in the old world. If it tasted good, this history was welcome to stay. By proxy, we were too. And also the accent on all things making me unalike regular kids. I never felt more revealed than during that time. Yet, I was relieved to learn American born Americans (while raised with too much optimism to have the capacity to understand our despondent refugee stories), had an affinity for foreign food. During those years, hoards of people passed through our home. All were served a little bit of this and a little bit of that. Some liked the soup. Some salad. But it was burek and pies they came back for. Spinach pie. Potato pie. Mixed meat pie. There was only one occasion not even pie was able to fix. Middle school. Lunch. I sat by a girl so hungry she spat in her fries immediately upon getting them so other kids wouldn’t steal them off her tray. It was mid 1990s. Twenty minutes away from Washington DC. And there existed kids who spat on their fries so they could eat all of them. There were hungry people everywhere, I learned. For some school lunch was the only thing they’d eat that day. Once, I took out a round of pie like the ones we’re making. As I was getting ready to eat it, the spitting girl asked me what it was. “Flaky pastry with a stuffing,” I explained. She looked at me with a look of disgust reserved only for lowest of the low. Embarrassment engulfed me. I didn’t bring pita to school again for years. And I despised the spitting girl with bottomless passion. The thought of her pricks me even now. If I saw her again, I’d feed her some of my pie. Force feed her if necessary. And she would love it. Just like you will. Bless your heart. My heritage is Cypriot one side, Bulgarian the other. I had a similar experience with stuffed grape leaves, one boy mocked them calling them goat poop. 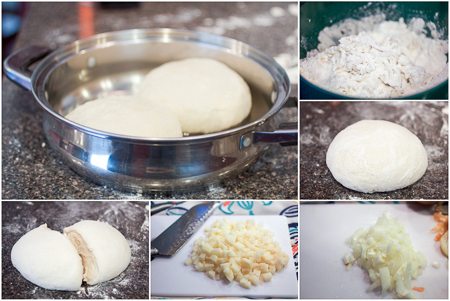 What are you going to do..these look delicious and the dough looks so well done. I don’t know if I have the skill to make them so thin but I will try one of these days for my grandma’s memory sake. Here are some versions with filo from the store. You can decide which filling to use. Good luck! Great recipe. What would you recommend as a recipe for cheese filling in this pie, instead of meat and potatoes? It looks good, tastes even better! Mama’s gonna make this one soon for my boys! 🙂 And Aida, you rock! Thanks for keeping the taste of home going strong. Thank you! I’m glad if you find them helpful. If you think of another one you might like, let me know. Meanwhile, congratulations on Sage Abbey! I hope it’ll be a smashing success. I am from Bosnia (living in San Francisco) and I never understood why people from other parts of the Balkans called other pitas “burek” until now 😉 But to me burek will always be meat pita! Thanks for sharing your wonderful recipes! Glad you’re finding the recipes helpful. Enjoy the wonderful SF & happy holidays!